Chatham Centre in Schaumburg is one of many properties in the submarket that is getting a new look. Several suburban submarkets don’t have trouble attracting tenants. 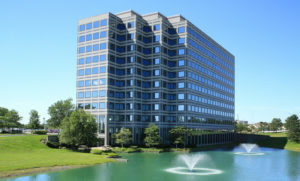 CHICAGO—The suburban region may have a persistently high vacancy rate, but class A properties in towns like Schaumburg, Oak Brook and a few others, are seeing very strong demand for office space. And many landlords stand ready to upgrade such properties. Officials from Chicago-based Core Acquisitions, a boutique commercial real estate investment, development and asset management company, say they will soon launch an extensive $7 million renovation and repositioning of Chatham Centre, a 10-story, 205,000 square foot class A office building in Schaumburg. The building sits at 1901 N. Roselle Rd. at the southeast quadrant of the new I-90/Roselle Rd. four-way interchange set for completion by the third quarter. As part of the multi-million-dollar renovation and repositioning program, Core Acquisitions has allocated resources to upgrade lobby and outdoor terrace spaces, enhance its onsite food service operations and complete top of the market tenant build outs. One of the notable highlights of the lobby improvements is the creation of a “bleacher style” seating area patterned after the feature installed in the Merchandise Mart. This provides a unique setting where people can work, eat, collaborate on projects and hold informal meetings. These improvements are in addition to the new conference center and fitness center which were completed in 2017 by the previous owner. The company will begin construction on the improvements immediately and finish by year end. Tenants already lease 70% of Chatham Centre. An enticing option for a future tenant is the availability of the entire top floor which totals approximately 20,000 square feet of space. Chatham Centre is also offering the building’s top signage rights to a large user. Core hired Colliers International to lease and manage the property and D+K Architects as its design and architecture firm. The acquisition was financed by New York-based Prime Finance.